October is Breast Cancer Awareness Month. This year, The outlet at Orange is partnering with Susan G. Komen® to support the fight against breast cancer, engaging employees, retailers and shoppers in ‘Mission Pink®‘. It is to not only contribute to finding cure and bringing awareness to breast cancer but also celebrate the survivors’ stories and stories of their families. 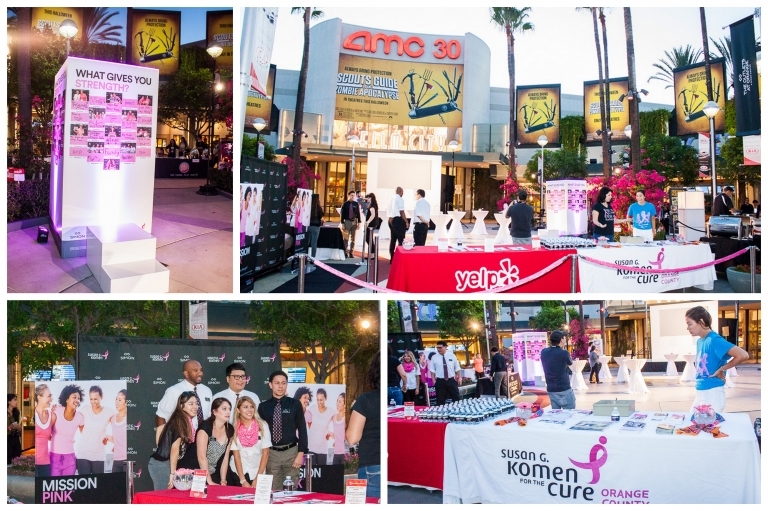 On October 13th, 2015, The Outlets At Orange and Yelp OC Elite community came together with Susan G. Komen Foundation for a night of fashion, prizes and delicious food. Participants of the event were encouraged to share with everyone what gives them strength by donating $1 and writing their message of strength on a “brick” which is then used to create the wall of Strength. Many guests also took pictures to go with their messages and shared on social media. It was a great opportunity for survivors and their families to visually articulate their strength during their fight with breast cancer. To donate, visit the Guest Services (located next to Nike Factory Store and Jamba Juice). The Fall Fashion Runway Show was produced by Neiman Marcus Last Call and Saks Fifth Avenue Off 5th. Many of the restaurants and retailers also sponsored delicious food and donated prizes for the night. Neiman Marcus Last Call – Sugar Cookies. Lucky Strike – Chicken pillow and BBQ meatball. Sweets From Heaven – Assortments of Candies. Lucky Strike – Chocolate Chips Cookies. El Torito – Taco Bar. Dave & Buster – Video Game, Lasagna and Meatballs. Stella Artois – Beer, Wine and Gift Basket. TGI Fridays – Buffalo Wings, Spaghetti and Burger Sliders. BJ’s Restaurant – Pizza and Lettuce Wrap. Burke Williams – Chair Massage. Wall of Strength: For a $1 donation, survivors, families and / or friends write their message of strength on a laminated “brick”, are encouraged to take a picture and post their picture on our Wall of Strength and share via social media. Voucher Program: $10 voucher cards, available at Guest Services, will offer 25 percent off one item at all participating retailers. One hundred percent of these proceeds will benefit Komen. Local Programming: Visit AMC Court to see the pink light display and the Messages of Strength featured on the Walls of Strength. Festive pink flowers and pink lighting will illuminate AMC Court to show The Outlet’s at Orange’s support of Susan G. Komen and Breast Cancer Awareness Month. 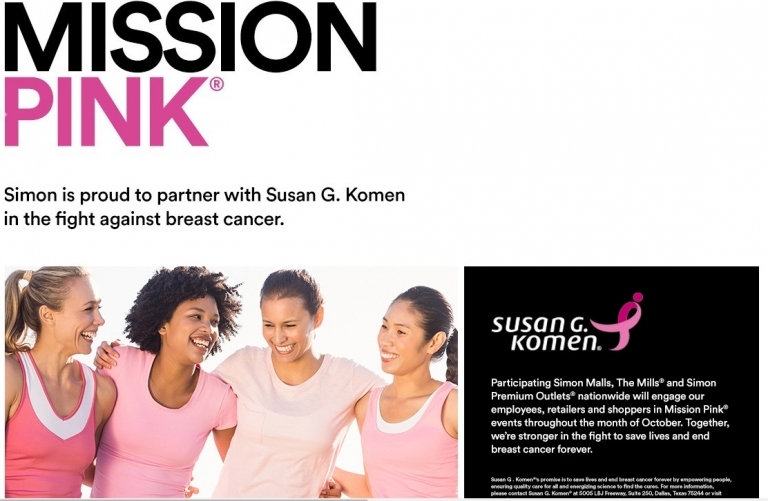 Surprise and Delight: Generate awareness of Susan G. Komen’s Breast Cancer Awareness Month by surprising randomly selected shoppers with ‘Mission Pink’ treats as they shop. Simon is proud to support Susan G. Komen through various fundraising initiatives, and along with the help of generous customers, will guarantee a contribution of at least $250,000. So start your holiday shopping this Saturday, October 24th by visiting The Outlets of Orange and help support the fight against breast cancer!